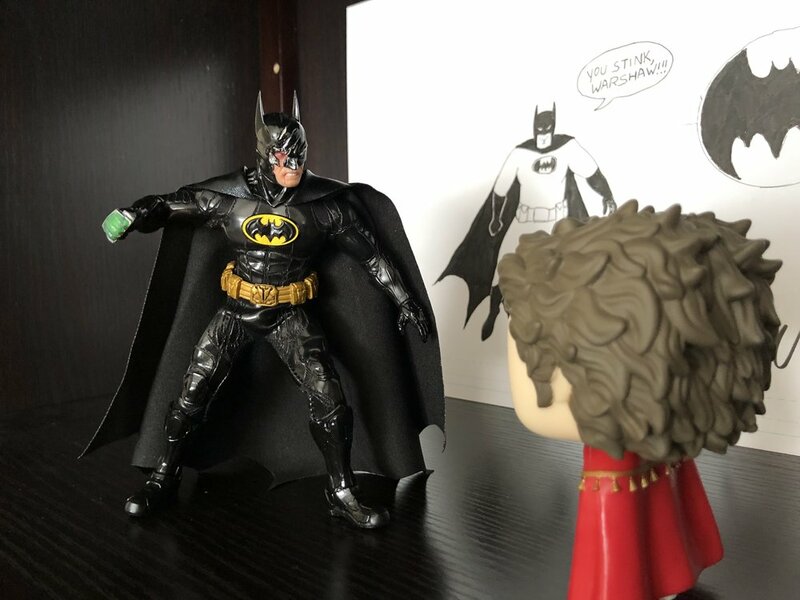 I’ve been aware of Mezco for some time now—their DC-based One:12 figures caught my eye in Previews a few years back, and I’ve been watching them fairly closely since then. When they announced their John Stewart Green Lantern last year, I preordered it immediately. Shortly after that, they announced a variant edition of their upcoming Sovereign Knight Batman, and I jumped on that, too. This “Onyx Edition” Batman arrived at my house a few weeks ago, and I’ve been photographing and playing with it since. Simply put, it’s an outstanding figure, and if you only know Mezco from pictures—or even from the other side of a glass case at a convention—then you don’t totally understand the appeal yet. Let’s take a closer look so I can explain why. I’m not a fan of window boxes, so I appreciate the box quite a bit. 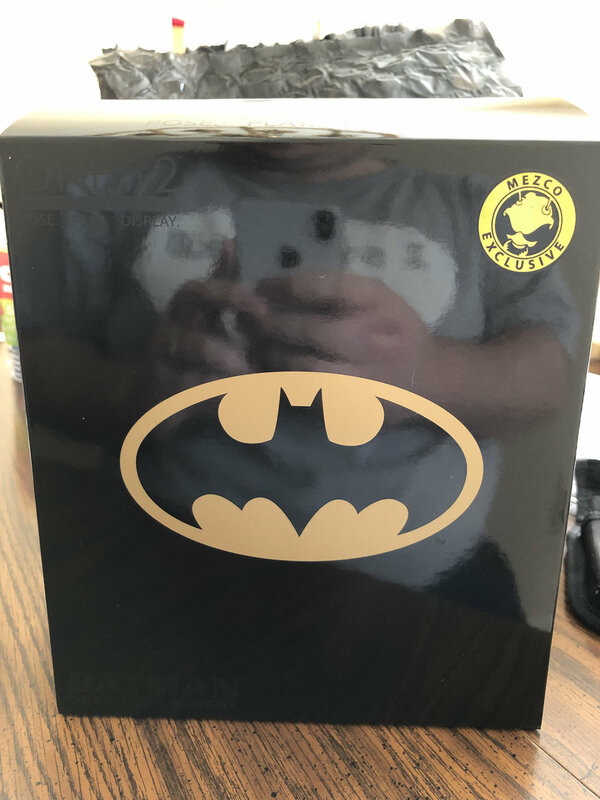 It’s very minimalist: mostly black, with a gold oval Bat symbol, and a picture of the figure—sort of—on the back side. I say “sort of,” because it’s actually a picture of the regular Sovereign Knight, rather than this particular edition. 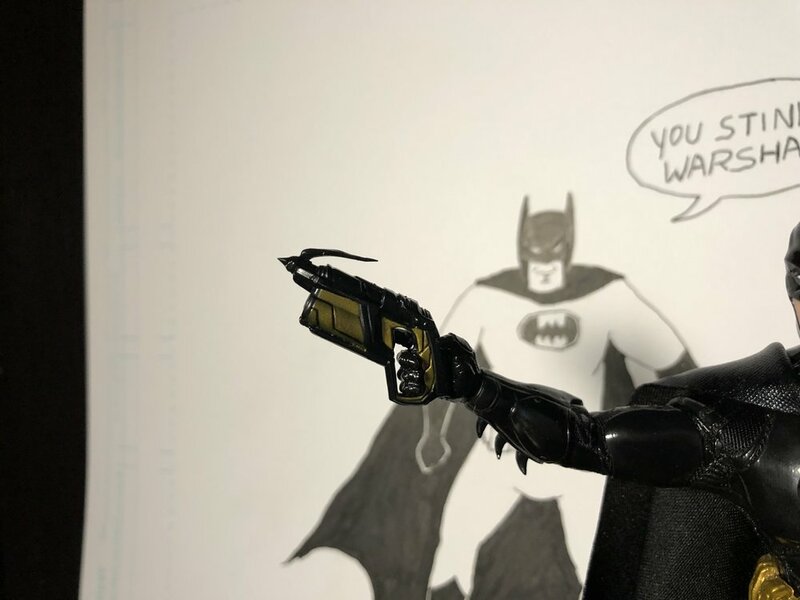 The parts and accessories are numerous and varied, providing Batman with a decent arsenal and hands capable of using it. There’s also a kryptonite-knuckled fist, in case Bats is trying to subdue any Kryptonians. The grapnel is cool, but the string standing in for rope is one of the least convicting parts of the figure, so I think I’d have preferred bolts without it. The Bat-drone is a neat, unexpected accessory, and while I think it’s a cool design, I don’t love the gold accents—that goes for the accents on the grapnel and the sonic weapon, as well. I like all of the heads, but I was surprised to find that, in person, I prefer the standard, longer-ears version. 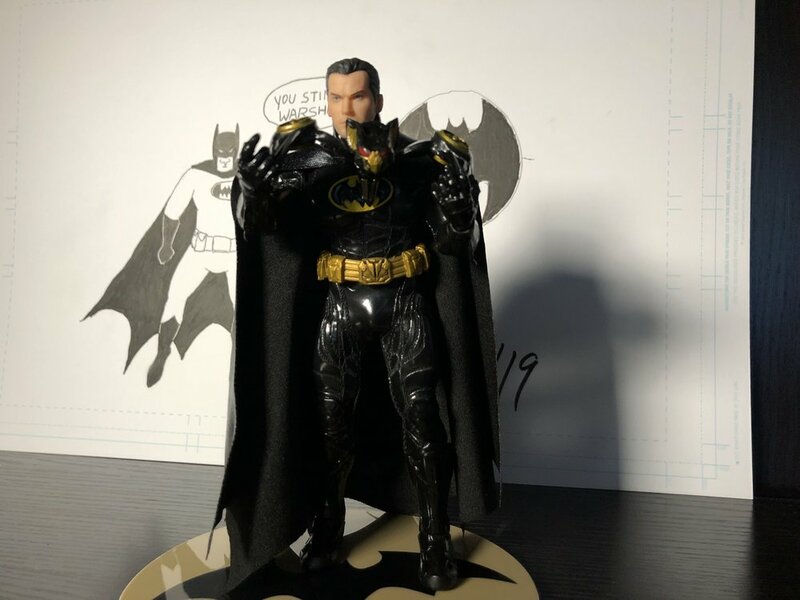 I expected I would display my figure with the short-eared cowl, but between the less-appealing facial expression and the near-invisibility of those ears when I’m not right up on it, I found the default a better choice. The battle damage and Bruce heads are excellent too—especially in that Bruce’s skin feels different than the cowl material. This figure feels ridiculously well-made. 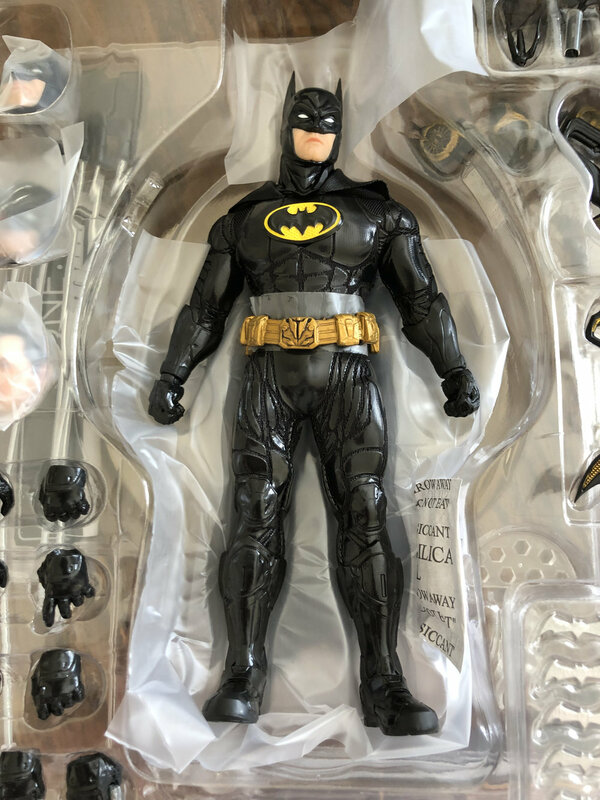 Time will obviously tell the story of its durability, but right out of the box, it feels way more solid than anything in my collection, from Marvel Legends up to my SHFiguarts Nolan Bats. The interchangeable parts are also very well made, and they go on and off easily, but with enough perceptible physical feedback that you’re confident you did it right. The suit materials are all first-rate, too. I love all of the different textures here—there are a lot of lines, but it manages not to feel too busy, and the contrast of the glossy armor plating and the flat underlayer is very cool. The cape is well-made and looks great, too. This figure is highly posable, with all of the now-standard points of articulation. As you might expect, though, extreme poses are more difficult/impossible to pull off with the restriction of the suit over the joints. So aiming the grapnel high or doing a high kick are out of the question without some sort of assist, but there are still lots of exciting, awesome, fun poses in here. The cape? The cape is one of my favorite parts. 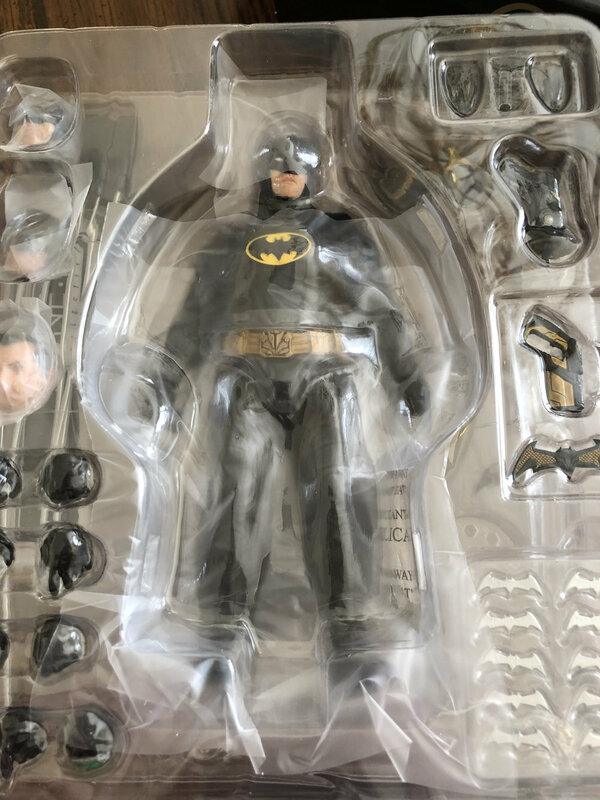 Mezco created it with very prominent creases so that it’s easy as pie to switch between cape-over-shoulders or cape-enveloping-Batman, or some combination. And it looks great in any configuration I’ve tried. Like most of Mezco’s One:12 Collective figures, Batman comes with a display base that features the standard stud. 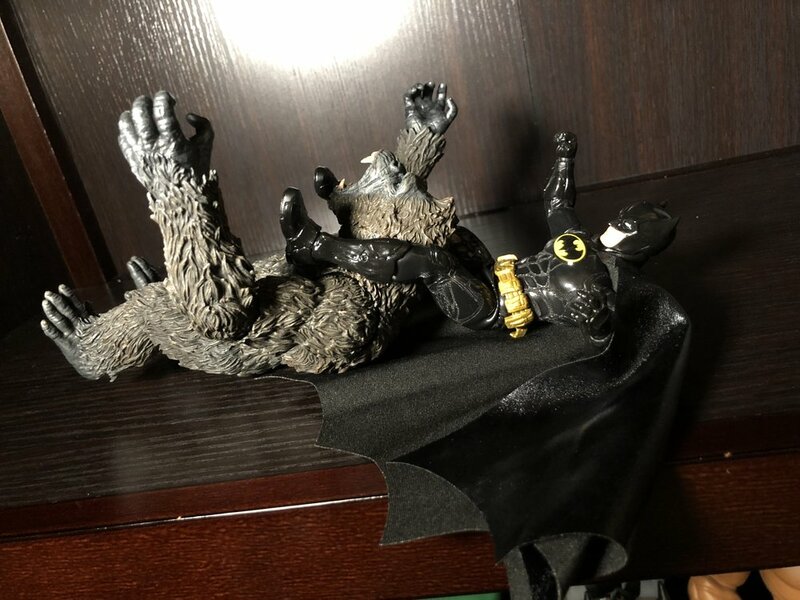 It also has a display arm that can be installed in place of the stud, and a cape articulation attachment that can be used to precisely sculpt the look of the Dark Knight’s drapery. Honestly? I expected to get no use out of the display arm, and especially the cape articulation dingus. But once I started playing around with them, I got hooked. It’s tough to figure out the cape appliance at first, and there were no instructions for it in the package, but once I did figure it out, it was tons of fun. I can definitely see myself mixing it up and doing an airborne Bats from time to time, and the arm and cape thingie will come in handy. This is my second Mezco figure, but as my first was (the excellent) King Kong, I feel like I’m starting fresh. And honestly, I’m blown away by the quality of this Batman, and I’m having way more fun than I expected—dare I say—playing with it as I work out different display options. You may have lost your opportunity to get your hands on this specific figure, but I suggest you keep your eyes on Mezco, so that next time, you won’t miss out. Apr 24 Preorder Mezco's One:12 Moon Knight—it's like getting four figures in one!